What is a Plinth Beam and its Purpose in a Building? Plinth beam is a reinforced concrete beam constructed between the wall and its foundation. Plinth beam is provided to prevent the extension or propagation of cracks from the foundation into the wall above when the foundation suffers from settlement. Plinth beams distributes the load of the wall over the foundation evenly. It is mandatory to provide plinth beam in areas that prone to earthquake. 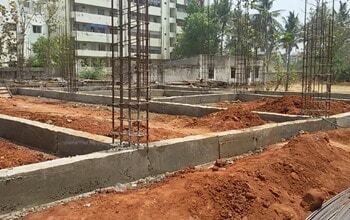 Construction of plinth beam above the natural ground is another application of this type of beam. Strength of plinth beam concrete shall not be smaller than 20MPa. If concrete is mixed manually, then an extra of 20% cement need to be added to the mixture. Figure 3 show plinth beam concrete preparation placement. 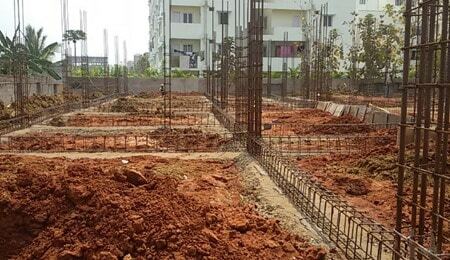 A minimum depth of plinth beam is 20cm whereas its width should match the width of final course of the foundation. 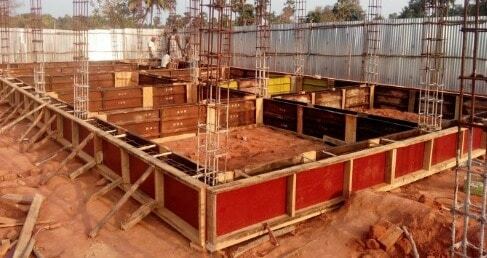 Formwork used for plinth beam construction should be properly installed and adequately secured prior to concrete placement as shown in Figure-4. The concrete needs to be compacted sufficiently to prevent steel bars from aggressive elements. It is recommended to provide two bars with minimum diameter of 12mm at the bottom of the beam. Similarly, two bars with minimum diameter of 10mm shall be provided at the top of the plinth beam. Reinforcement bars should be protected by 25mm concrete cover. As far as stirrups are concerned, stirrup diameter should be at least 6mm and a spacing of 15cm should be sufficient.